It’s impressive how cars can cover miles when reaching a destination. But you know what’s more impressive? When cars go the extra mile and insist they’re more than just the rolling receptacles they’re designed to be. In today’s blog, APW looks at some fairly amusing but definitely amazing cars that were successful in expanding their primary role to roll. We’re not so sure how this will fare against its sturdier counterparts, but when a Beetle says he can go to battle, missiles and all, we listen and acknowledge the boldness. Such a cute war machine! We’ll just go ahead and say it—carpool! 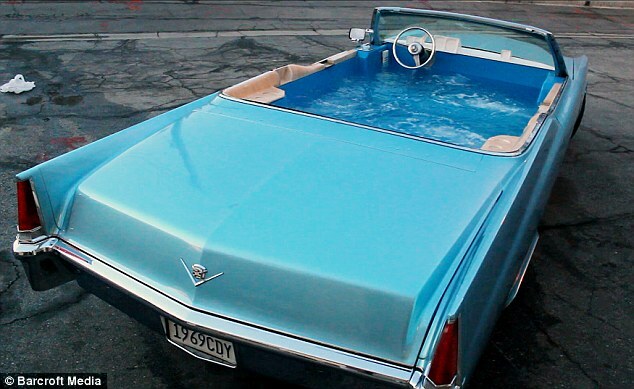 Two friends from Los Angeles decided they’d take carpooling to a whole new level and ended up with this car…pool. It’s a sweet-looking, operational Cadillac tagged as the World’s Fastest Hot Tub. Fun fact: The car’s original V8 engine is used to keep the water temperature perfect. Just one of those days wherein science wins! Bring that Cadillac-turned-hot tub to the parking lot with this Hummer and it’s an instant pool party. With that booming sound system installed, this tricked-out SUV won’t just be humming but hollering for everyone in the ‘hood to come out and rave till the crack of dawn. Definitely one of the most iconic cars ever to grace the silver screen. By that alone, the car doubles as a piece of history. But the more obvious reason it’s here on the list is because this winged DeLorean, as we all know, is a banging time machine we have, for once in our lives, wished we could’ve piloted. To most, especially the younger generation of future drivers, this guy based on a Chevrolet Corvette (C6) isn’t just an anthropomorphic stock car—it’s childhood.